Plastic buttons are currently held to be less desirable than buttons made of natural materials, but when Sean Connery was James Bond in the 1960s they were the standard choice for lounge suits amongst England’s best tailors. 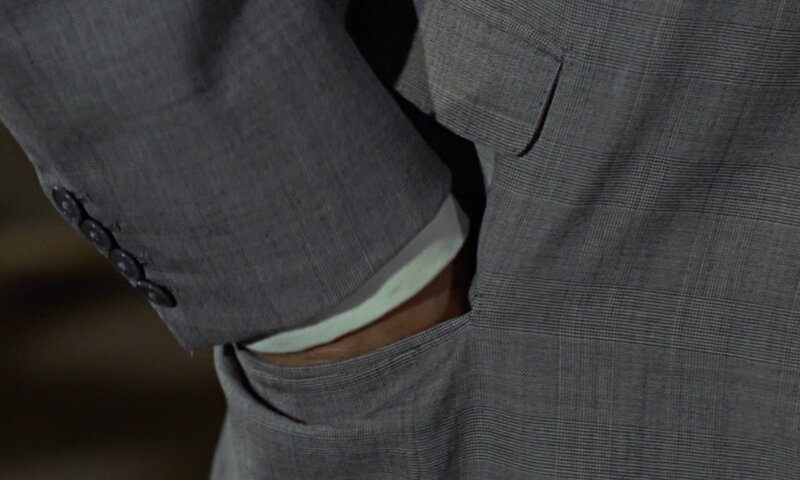 Almost all of Sean Connery’s Anthony Sinclair suits in his 1960’s Bond films have thin, plain, glossy plastic buttons, and most of Roger Moore’s Cyril Castle suits and sports coats in Live and Let Die and The Man with the Golden Gun have the same type of buttons. Though it may seem illogical to put inexpensive plastic buttons on bespoke garments, there are reasons to why plastic buttons were used. Dark grey plastic buttons on an Anthony Sinclair dark grey flannel suit in Dr. No. The smooth texture of the buttons does not fit with the fuzzy texture of the flannel cloth. The uniform look of plastic buttons matches the clean look of worsted suiting, and some people believe that horn buttons look too rustic for a city suit. Plastic buttons also can be made in virtually any colour, so they are typically matched with or used in a slightly darker shade than the suit. In the 1960s and 1970s, synthetics were not so taboo in quality clothes the way that they are now. Tailors may also have liked how plastic buttons were thinner than other choices. Douglas Hayward, who typically used horn buttons, used grey plastic buttons on both Roger Moore’s grey flannel suit in For Your Eyes Only and on his grey tweed jacket in A View to a Kill since horn is not found in a flat medium grey, and he wanted to match the buttons to the suit. These grey plastic buttons, however, have a matte finish like horn instead of the shiny finish buttons that Sinclair and Castle used. Timothy Dalton’s suits in Licence to Kill, not surprisingly, have plastic buttons. Most of Pierce Brosnan’s and Daniel Craig’s Brioni suits—worn in GoldeneEye, Tomorrow Never Dies, The World Is Not Enough, Die Another Day and Casino Royale—also have plastic buttons. Not all plastic buttons are created equal. Brioni’s plastic buttons both look nicer and are more durable than the average plastic buttons. This is not to say they are just as good as natural materials, but the plastic buttons give the makers of Brioni suits the look they want. Timothy Dalton’s suit buttons in The Living Daylights are another kind of plastic, made from urea. These urea buttons mimic horn but often have a more pronounced grain. Unlike horn buttons, which due to nature can never be identical to each other, the grain of urea buttons will often match each others. If the buttons look like horn but are suspiciously identical, they can’t possibly be authentic horn. The grey buttons on the black-and-white pick-and-pick suit in Skyfall are similar fake horn in urea. Interestingly, this post reminds me of a conversation I had with a young guy a while back. He was of the mindset that what was in style for his generation (we were specifically speaking about the long-on-top-very-short-on-the-sides haircut) was “right”, and all the other types of haircuts in the past were “wrong”. It reminded me that when I was his age, I thought that my generation’s style represented people finally “getting it right”. Try as I might, I could not convince him that styles change. He absolutely could not conceive that there was, or would be again, a time when what he thought was inappropriate would be valued by others. I’m old enough (45) to have seen a lot of things go in and out of style and what this post reminds me of is how there are often competing justifications for different things. I was just talking to someone about sweaters – I often hear that thin sweaters are a mark of quality because they are so well made that they will keep you warm and not wear out despite the thin material. But I remember when thick sweaters were “in”, the justification was…look, it’s high quality because we aren’t cheapening our products by using less material! For this reason, the only determining factor for me in terms of what buttons to have on my suits would be “What looks better?”. Horn…plastic…who cares? As long as they look good and appropriate for the suit. Good points. I wouldn’t just attribute this to style but also to standards. Savile Row tailors for the most part have higher standards for their work today than they did 50 years ago.When I compare vintage suits with modern ones the difference is noticeable. It may have to do with tighter competition, or people may be comparing the work of English tailors with the often more meticulous work done by Italian tailors. Are you telling us that the almighty Goldfinger suit has plastic buttons?! Indeed it does, just as most of Connery’s suits have. That’s no big sensation. Even some very famous houses on Savile Row were known for using only plastic buttons – Anderson & Sheppard f.i. did that for quite a long time. -I am not sure if they really have. F.i. 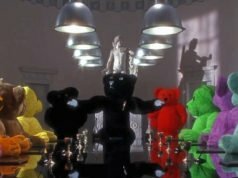 Mr. Andrew Ramroop who runs Maurice Sedwell thinks that Savile Row standards have lowered considerably over the years and for quite some time he tries to convince the other SR tailors that they should make an effort togehter to re-establish them (for example by improving formation standards). Another reason for the decline in quality is often seen in the fact that there’s too much outsourcing today. It’s how they all have the same grain. Natural horn can range from beige to brown to black. Some can be grey, but it will almost always have brown mixed in. If the buttons are other colours, they are either fake horn or horn with a coating. Someone in the button business told me that dyeing horn buttons is very difficult, and the process is very dangerous. It amazes me how many guys I hear of passing up otherwise great used clothing because the buttons are plastic and they figure the rest must be cheap too. To paraphrase of the best women of the Bond films, “There are plastic buttons and there are PLASTIC BUTTONS.” Same goes for shirts. The buttons you see on the $20 JCP special are not the same as the high quality resin on a Brooks Brothers Luxury line shirt. Ironically, working cuff buttons ARE a good reason to pass up a great vintage item if the sleeves don’t fit within a smidge of your ideal. Let out or taken in too much, it will look unbalanced. I’m sorry to go off-topic but I have am wondering about something. I am planning to order a suit and I have chosen a fabric, but I wonder if you can tell me what exacty the fabric would be called and also the colour, since you have a great eye for theese things. I know the fabric is a 100% wool super 110’s but I’m not sure about the weave or weather it woud be called lightweight or not and the colour, is it dark grey or mid-grey? I have three images of the fabric sample. In the first picture, due to the picture being overexposed, the colour looks much lighter than it appaers in real life. How would you describe the fabric? 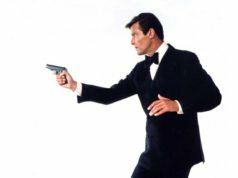 Has Bond ever worn anything like this? That’s a pick-and-pick cloth, also known as sharkskin, and yours looks darker than mid-grey. James Bond wears a mid-grey pick-and-pick suit in the opening scene of Skyfall. Thank you very much for answering! So I guess the fabric is dark grey then. I thought the suit in the Skyfall opening sequence was light grey. But then again, that one has no charcoal/black threads in it, right? It’s just darker and lighter greys? This one seems to have charcoal (or black?) and mid-grey then, am I correct? The Skyfall cloth has black and white yarns in it. I can’t tell what’s in yours. From looking at this fabric up close in good light, I’d say it’s a mix of charcoal, mid grey and light grey. I have compared it to another similair pick-and-pick fabric that has black in it and that has much more contrast. From a distance, would you say this looks close to Brosnan’s pick-and-pick suit in TWINE? I know that one is blue and brown but it does look similair to this from a distance. I think you’re right that it’s similar, since it’s darker and has less contrast. Some of Sean Connery’s suits may be similar, but I haven’t been able to discern a pick-and-pick pattern in any of his suits for certain. The train suit in From Russia with Love could possible be very similar. Your cloth is a very versatile one, more so than Daniel Craig’s because of the darker colour. My suit arrived some days ago, I thought I’d post some pictures of the complete thing. The fabric is great, leightweight but sturdy and the suit is indeed very versatile. Since the material is very high quality I wanted to get a style/cut of suit that is very classic and can be used in many different situations and with a timeless look that never looks out of date. The lenght and overall cut of the jacket is classic and the shoulders are neutral with roped sleeveheads (correct?). I asked for slightly wider lapels than what is common nowadays but wich looks good on me, yet they where still pretty modest with the width and the result is about average – I suppose this is what is nowadfays considered wide. I thought about making the suit a little different by adding gauntlet cuffs to the sleeves, wich I felt was going to add a subtle touch of flair to this overall very understated and classic suit, yet in the end I decided just to go with one button, wich is something I like too. The trousers have a higher raise than most trousers today, reaching up to just above my bellybutton. I requested they’d be made with side adjusters in the same style as on the Tom Ford suits (I personally detest belts with suits). I’m very happy with the suit, it’s basically the most versatile suit one could own . It’s good quality and really meant to be worn. That looks fantastic! The sleeveheads don’t look very roped, however. Thank you very much! I guessed the sleeveheads where roped because the seam where the sleeve meets the shoulders are sort of re-enforced (is that the English term?) and a bit stiff while the rest of the shoulder has no padding. I thought a completely natural shoulder had very soft and unstructured sleeveheads. I might be mistaken – this blog was where I first came into contact with many of theese terms, like roped sleeveheads, and I might have misunderstood what it means. What would you call theese shoulders then? It’s still a natural shoulder because the shoulder has no padding. The roped sleevehead is when there is a defined bump at the top of the sleeve that is created with wadding, and I don’t see that in your photos. Unless it’s a shirt sleeve, there needs to be some reinforcement (usually in the form of canvas) in the sleevehead. This helps the sleeve drape, but for roping the sleeve is cut differently and there is soft wadding inserted along with the canvas.